Biconical antennas are used for emissions and immunity testing to meet various EMC standards specified by FCC, CISPR and EN. 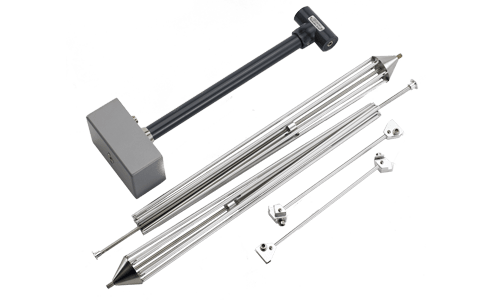 The broadband characteristics of the biconical antenna make it a good choice for making sweep measurements and for automated measurement systems. Normally, tuned dipole antennas are used for EMC site attenuation measurements for better accuracy. However, the biconical antenna is easier to use for vertical site attenuation measurements, because of the long dipole element lengths at lower frequencies (5 meters at 30 MHz). According to ANSI 63.4 specification, calibrated biconical and a log periodic antennas can be used for site attenuation measurements. The calibration data provided with each antenna is used to calculate field strength measured for the selected frequency. The antenna factor (dB/m) is added to the measured output (dBV) displayed by the EMI meter to obtain field strength (dBV/m). Biconical antenna model AB-900A is used for emissions and immunity testing to meet various EMC standards It has a frequency range of 25 MHz to 300 MHz. Its broadband characteristics make it ideal for a wide range of EMI testing applications, including demonstrating compliance with FCC, CE, MIL-STD, RTCA DO-160 and other requirements. AB-900A biconical EMC broadband antennas feature durable aluminum, and we powder-coat them for additional corrosion resistance. 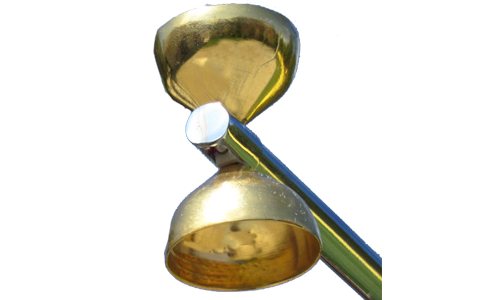 Features include a gamma match rod that avoids the issue of dipping between 275 and 290 MHz common to other biconical antennas. The model ABF-900A offers the same benefits as the AB-900A model and is also conveniently designed to be collapsible for easy storage and transport. As a result, it is an excellent choice for offsite applications. You can also connect the ABF-900A to an RF power amplifier (up to 50 watts) to generate RF fields for immunity testing. As with all of our biconical EMC broadband antennas, we back the ABF-900A with a three-year warranty and deliver it calibrated to ANSI 63.4, NIST-traceable specifications. The Microwave Biconical antenna is specifically designed to be the transmit source antenna for test site validations above 1 GHz per the CISPR 16-1-4 Site Voltage Standing Wave Ratio (SVSWR) procedure. It is precisely tuned and linearly polarized, and it features a lightweight design for easy to transport and setup. Other potential applications of the ABM-6000 include field surveying, performing amplifier harmonic measurements to IEC 61000-4-3 standards and any other testing in which you need to measure high-level signals with a minimal amount of field disruption. Com-Power is a recognized leader in the development of biconical EMC broadband antennas. We back our products with an outstanding commitment to quality and accuracy. We are pleased to provide extended customer support for all of our products, including repairs and recalibration. Our biconical antennas are the result of years of research and innovation. They meet the testing and certification requirements of customers in any industry. Whatever your EMC testing needs are, let us provide you with the right tool for the job. For more information about any of our products, contact Com-Power today.